This is a fine example of the Queen Anne style, and displays the eclectic decorative elements characteristic of the style. The cut shingles and half-timbering provide surface interest, while the varied window shapes are another decorative feature. This is perhaps an unusually ornate residence for a Congregational minister, but it reflects the prosperity of Lenox at the time of its construction. This Queen Anne style building has two stories, a slate roof and is intact. It is a two bay, wood frame house with a cross-gable roof. There is a gable dormer on the front and gabled wall dormers on the left and right sides. There is a Palladian attic window in each dormer and the cladding is wood clapboard and decorative shingle. The organization is asymmetrical and there is an irregular footprint. The enclosed front porch is glazed with turned posts and a gable feature over the entry. There is a two-story box bay on the front facade to the right of the entry with sunburst decoration on corner brackets supporting a gable roof overhang. This house stands on the site of the original Congregational parsonage, a brick building dating from 1852. By the 1890’s it had fallen into disrepair and the congregation elected to build a new house on the same site. According to a turn-of-the-century magazine article, “Few Congregational Churches in Massachusetts have so fine a home for their ministers”. This reflects the prosperity of Lenox during this period. This house was used as a parsonage until 1925, when the Congregational Church was given the Worthington House on Cliffwood Street which became the home of the minister. For many years it was the home of Edith O. Fitch, a long-time Lenox Librarian. 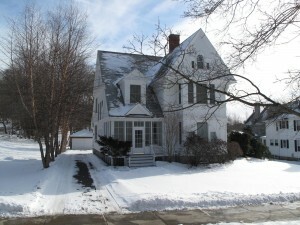 The old parsonage was acquired by the Toole family and then in 1978 by the Biancolo family. It has since been used as a private residence. New England Magazine, “The Church on the Lenox Hilltop and Round About It” by Frederick Lynch. October 1990.